This tender and tasty ham may be served for any occasion, breakfast, lunch or dinner. Simmering the ham before baking neutralizes the salty flavor of ham and the raisin glaze adds a perfect subtle sweetness. Place ham cut side down into a large deep pot. Add water and ¼ cup maple syrup and bring to a boil, reduce heat to a low simmer covered for 2 to 2 ½ hours. Uncover and cool slightly. Remove the ham from pot and reserve 2 cups of the water. Remove all the excess fat and rind from the ham leaving a thin layer. Transfer the ham to a roasting pan cut side up. Whisk together sugar, ½ cup maple syrup, mustard, apple juice and ground cloves in a medium bowl, mix in raisins. Pour 1 cup of the reserved liquid, then spoon raisin glaze all over ham. Bake in middle of oven basting often using additional reserved liquid if needed, until ham is bubbling and glazed, about 40-45 minutes. Transfer to a serving tray and spoon pan juices over ham. Serve warm or at room temperature. 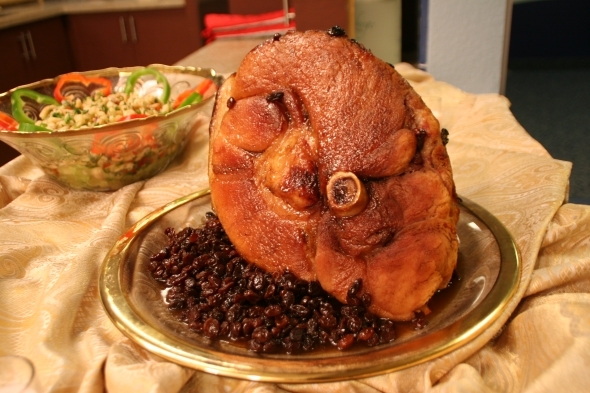 * The ham may be simmered one day ahead of time, cooled then refrigerated in pot with the liquid. Bring to room temperature before baking.